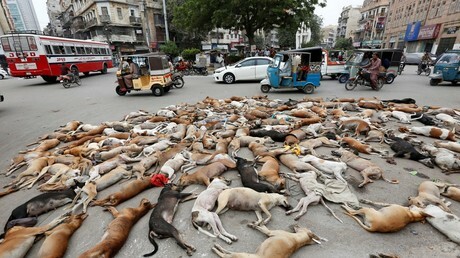 A picture circulating online of an alleged dog cull in Russia actually depicts Pakistan, during an attempt to reduce the number of stray animals on the streets of Karachi in 2016. Ahead of the World Cup there were fears that Russia would try to exterminate stray dogs in time for the arrival of fans. However, Deputy Prime Minister Vitaly Mutko said that the animals would be captured and placed in shelters. A Twitter user has now posted an image that purports to show scores of dogs lying dead in a street somewhere in Russia. But while the picture does show more than 50 dead dogs, it was actually taken two years ago in Pakistan. Gross example of disinformation! Sickening effort! Another Twitter user by the name of Fabio also hit out at use of the Pakistan picture which was used in a Reuters article in 2016. The story in question revealed how more than 700 dogs in Karachi had been tracked and poisoned over the course of a few days. “The picture you used is indeed the illustration of a crime in my honest opinion, but it is not from Russia,” they said.